Black beans, also known as turtle beans, are small, dark-colored varieties of the common bean (Phaseolus vulgaris). As with all other common bean varieties, black beans are native to the Americas and have been revered as an important food source for thousands of years. Nowadays, black beans are cultivated and eaten all over the world, and are a common ingredient in Mexican, Brazilian, Cajun, and Creole cuisines. 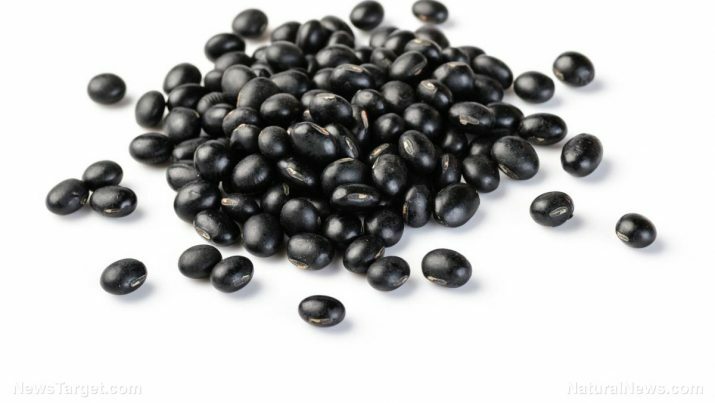 Just like other beans, black beans are packed with important nutrients that are good for the body. Black beans are an exceptional source of molybdenum, with just one cup providing 287 percent of the recommended daily intake. This rare and invaluable mineral aids in the development of the nervous system and in cell energy production. In comparison to other beans, black beans contain an impressive amount of antioxidants, particularly flavonoids and anthocyanins. Both flavonoids and anthocyanins protect the body from free radicals and diseases. Black beans are a good source of protein as well, which is why they’re often combined with brown rice to serve as a complete meal, one that is composed of foods from all of the basic food groups go, grow, and glow. Black beans are full of nutrients that can prevent heart disease. Fiber, potassium, and vitamins B6 and B9 decrease the bad cholesterol levels in the body, while the anti-inflammatory properties of antioxidants lower the risk of developing atherosclerosis. Moreover, the small amounts of omega-3 fatty acids in black beans have a minimal anti-hypertensive effect that reduce blood pressure and improve blood flow. One notable benefit of molybdenum is its ability to reduce erectile dysfunction and impotence among older men, so eating black beans frequently can help out men who suffer from these conditions. Thanks to their high amounts of fiber and protein, regular consumption of black beans can help move food through the digestive tract with little issue. Normal bowel movements result in a healthier digestive system that’s less prone to such issues as constipation. Because of their varying concentrations of molybdenum and vitamin B9, black beans can be good for the nervous system. In fact, a deficiency of vitamin B9 has been shown to increase homocysteine levels and the risk of developing neurodegenerative disease like Alzheimer’s disease, so eating black beans can prevent the onset of neuro-degenerative disorders such as this one. Black beans are good for the cardiovascular system thanks to their wealth of heart-friendly nutrients, primarily fiber, potassium, and antioxidants. Black beans are versatile legumes that can be purchased dried or canned. Dried black beans are preferable than canned ones since their nutritional content is higher than canned black beans. However, dried black beans contain phytic acid, which interferes with mineral absorption, so be sure to soak dried black beans before preparing, cooking, or consuming them to reduce the amount of phytic acid coating them. Soaking black beans also gets rid of methane-producing oligosaccharides. Black beans can be added to just about any recipe, from tacos and stews to hash and salads. They can be eaten at any meal of the day, too. Black beans are a great addition to almost any diet due to their robust variety of important nutrients. They’re an especially good source of protein for vegetarians. The high fiber content of black beans is beneficial to the heart and digestive system. Black beans contain phytic acid and oligosaccharides, however, so soaking them hours preparing, cooking, or consuming them is recommended.